Yesterday, Friday, 25 January, the three-day Jaffna International Trade Fair commenced for the 10th consecutive year, under the theme ‘The Gateway to the North,’ held at the Jaffna Municipal Council grounds. 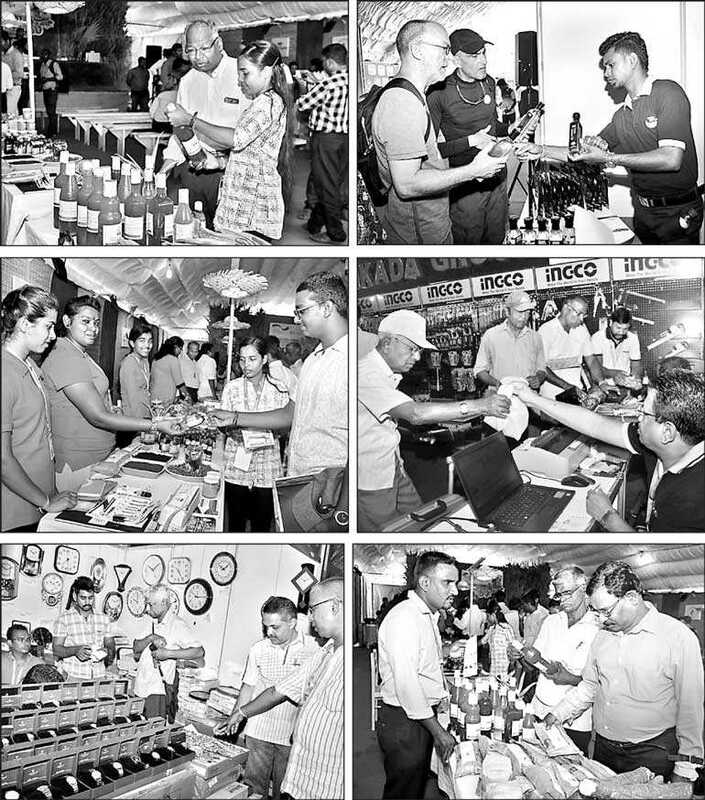 With 350 stalls featuring Sri Lankan and international products, fifty stalls were dedicated to the Northern region. Organised and managed by Lanka Exhibition & Conference Services Ltd. (LECS) in association with the Chamber of Commerce and Industries of Yarlpanam (CCIY) with the support of the Jaffna Municipal Council, the Sri Lanka Convention Bureau and International Business Council, the Jaffna International Trade Fair is an event which is hoped could leverage more business power to the people of Jaffna. The event comes in the backdrop where there is still a large vacuum in entrepreneurship opportunity and support being made available through a systematic policy to the people of the North who suffered seriously as a result of the three-decade-long conflict. “The first Jaffna International Trade Fair was held in 2003 during the peace process, at the Jaffna Central College. There were small makeshift stalls for the local producers, which totalled to 10, but the keen spirit of entrepreneurship of the Northern people was visible even then,” recalls CCIY President , K. Vignesh. 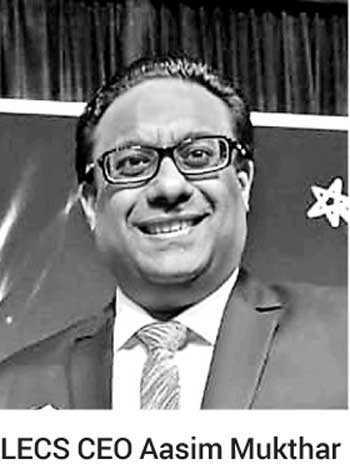 With the event being held annually since 2009, LECS CEO Aasim Mukthar points out that stalls are given to Jaffna entrepreneurs at a special concessionary rate as a means of promoting and encouraging them to exhibit at the JITF. Following are excerpts of interviews with representatives of the CCIY and LECS on the situation in the North with regard to investment, business development and entrepreneurship. Q: It is 10 years since the war ended. This is a long time. Why is Jaffna still referred to as having untapped potential for business development and entrepreneurship creation? A: There are many issues. It is not that there is no investment interest. There is. Right now I am having with me a massive project costing millions of dollars by a group of Jaffna origin Tamil diaspora members. They want to set up a sustainable model eco city, somewhat similar to the port city model. This project has been first submitted six years ago and the persons who wanted to invest in it have been going from pillar to post, from the provincial authorities to the Central Government members. It has now come to the CCIY and we have begun the process of evaluating this project which is expected to give a minimum of 45,000 jobs to the people of the north. Q: So you are saying that for six years there has been no interest to pursue such a project? A: The problem is there is lack of knowledge to evaluate such large-scale projects. This is not just a problem of the north but an issue pertaining to Sri Lanka. Many such investment projects could be lost to us as a nation because of this. In the north there is also the problem of not knowing who exactly to approach. There is the Provincial Council but there is also the belief that the Central Government has the final say. So the end result is that projects like this could get stuck somewhere and the investor finally gives up and takes his project to another country. In the north decentralisation of authority for systematic evaluation of such projects is an issue. Confusion abounds. Even initiatives to rectify matters end up shelved. For example the ‘one stop office’ opened at the Jaffna Kachcheri one-and-a-half years ago for industrial-related matters, where the objective was to clear bottlenecks in starting industry related projects was closed the following day itself. Q: So what exactly can the CCIY do? A: We have the commitment of not wanting to lose good projects that come to the north. We are doing our best to track issues investors may have and do a proper project analysis and contact the necessary authorities to pursue matters. Q: Pertaining to opportunities to create and promote northern products and take them up to international standards, what are the current initiatives that are being carried out by the CCIY? A: We have plans to put up an exhibition centre to specifically promote northern products and have selected the land which we want to obtain on a long lease. We are currently discussing this with the GA of Jaffna. On improving entrepreneurship, we work with institutions such as the International Labour Organisation (ILO) and the National Chamber of Exporters and we always lookout for other international partners that could help us in this regard. Through ILO we promote women, especially those who head families, to get technical training in cottage industries and have access to markets. In the last five years we have worked closely with the National Chamber of Exporters, striving to raise the standard of the northern SME products. Q: after the war ended, the hitherto closed economy of the north was opened and the region became one of consumers rather than creators of consumer goods. Could you comment? A: After the war ended we had finance companies flooding the north. These companies did not focus on creating entrepreneurs. The money was not given to start businesses. Instead they focused on merely making the people of the north consumer addicts of products the war ridden districts had not access to before. These companies first rented out premises and operated. Then they made their profits and built the office buildings in the land they bought in the north and finally the people who took loans had to sell their houses to settle their debts. As mentioned earlier we are trying to educate the people of the north on the importance of product creation. It is not easy to do as for 30 years the financial backbone of the northern people was crushed by war. In the post-war situation even somewhat-established Jaffna business people find it difficult to have access to loan schemes. 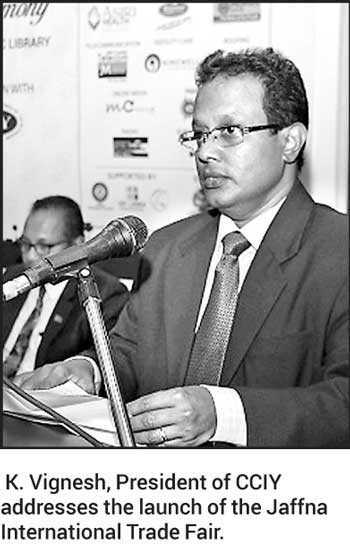 Q: With regard to the Jaffna International Trade Fair, compared to the 2009 event, what is the progress you have seen over the years in terms of new entrepreneurship within the north and the revival of Jaffna industries as a result of this event? A: This is an event that provides good exposure to the people of the north. Here international products are exhibited and sold. We need these kinds of events to stimulate the business mindset of the northern people and to promote interaction between the south and north with the rest of the world. However, much of the progress is hard to evaluate as it depends on the individual traders and the connections they make with the other exhibitors but we know that several Jaffna products have been promoted in south and internationally as a result of this event. Q: Could you comment on the tourism sector in the north? A: We are still continuing our initiatives to promote a professional tourism and hospitality sector in Jaffna. We think this sector will hold a lot of opportunities for the youth of the north and we have to plan out professional training. With Sri Lanka’s vision of receiving more than 4.5 million tourists in Sri Lanka by 2020, there is great opportunity for the whole of Sri Lanka. In the north we have also been trying for five years to get an information centre for tourism to be opened in the heart of the city. They have opened a tourism information centre in Mankulam but one in Jaffna is needed. Q: It has been noticed that despite there being a space for an industrial complex in Achchuveli, there is virtually no activity there. Why is this? Did the local industrialists and entrepreneurs show no interest? A: It is true that there are only few industries in Achchuveli. I strongly believe that the local industrialists and entrepreneurs need motivation, credit facilities and proper training to take up any industrial related challenges. It seems that they need some good role models to guide them to start an initiative. We have some locally and nationally popular business initiators and industrialists in Sri Lanka. It is our duty to approach them and get their professional expertise to see that this industrial complex functions well. CCIY is doing that. Q: What are your suggestions to the Government to improve industrialisation and entrepreneurship in the north as a whole? A: Everything is in blue print but there are issues of implementation. What is needed is to set up a strong foundation where doing business in north and investing in the north should not be arduous or ambiguous. The Central and Provincial Government entities should work in collaboration to improve industrialisation. We should help local industrialists to adapt some modern methods to make their industry more productive and workable and above all progress should be shown in action. Q: Could you speak of the first JITF that was held? A: The first event was really held during the ceasefire of 2003. It was a tremendous time for us to do an event in the north. We faced some obstacles to organise this event then. Thereafter, we started doing the show from 2009 onwards on an annual basis and we are committed to taking this event from strength to strength. Q: What are the main events you have held in Sri Lanka other than the Jaffna International Trade Fair? A: Many. Pro Foods/Pro Pack, Construction Expo, Office Expo and AISEX Expo to name a few. 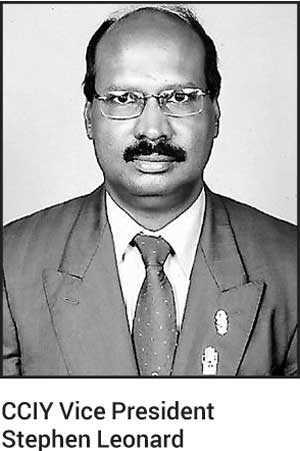 Q: How is the Jaffna Trade Fair organised; how much does someone have to pay for a stall and is there a discount for small-time entrepreneurs from Jaffna, especially women entrepreneurs who may be war widows? A: A stall can cost between Rs. 90,000 to 100,000 for three days. Yes, we do have special pavilions that cater to women entrepreneurs. We have a segment of stalls given free of charge by us to the Yarlpanam Chamber, which in turn re-sells them at a low price to companies in Jaffna. Q: Is there a monitoring and evaluation mechanism you have been following to record the impact of the trade fair in developing entrepreneurship and business development as a whole in Jaffna? A: We have tried to implement some sort of system to get feedback from the participants, but due to the vast numbers attending and the magnitude of the event, this has not been possible. Q: This year’s theme of the Jaffna International Fair is called ‘The Gateway to the North’. What is the ideal expectation from this year’s event under this theme? A: Now it is just about 10 years since we finished the war. We want to help in reconstructing and rebuilding the city of Jaffna and its suburbs. We have done many CSR projects in the past and want to continue doing the same this year too. We also want to promote tourism of the north through this event. We have our own travel arm of LECS Travels and Asian Wings. Tourism in the north has improved rapidly due to our show and it is not possible to get a decent hotel room during this event. We had to book well in advance to secure rooms for the staff. We have many international exhibitors who love coming to Jaffna. Q: Could you comment on the participation of international companies and investors in this annual event? A: Last year, we had over 70 companies from India. This year the numbers are less in terms of foreign participation. Q: After a 30-year war it is not an easy task to revive an entrepreneurial community. What more should be done in the north, by both State and non-State actors to facilitate and encourage entrepreneurship? A: I feel they should look at building the confidence of the people in the north by encouraging them to do more business. When business increases, then automatically the lifestyle increases. .From left: Stephen Leonard, Vice President, Chamber of Commerce and Industries of Yarlpanam (CCIY) K. Vignesh, President of CCIY, Gusti Ngurah Ardiyasa, Ambassador, Republic of Indonesia, Emmanuel Arnold, Mayor of Jaffna, S. Balachandran, Consulate General; of India in Jaffna, N. Vethanayahan, Government Agent of Jaffna and Aasim Mukthar, CEO, Lanka Exhibition and Conference Services Ltd., (LECS).